Thrive Global, was created to end the stress epidemic. Founded by Arianna Huffington, the comprehensive platform tackles burnout — a widespread barrier to productivity and success. By delivering sustainable, science-based solutions, Thrive Global enhances wellbeing and performance, so that people can move from surviving to thriving. How do You Launch a Global Platform in 12 Weeks? A Medium publication to house original and syndicated content from thousands of contributors. A robust e-commerce marketplace for products from Thrive and third-party vendors. An online education platform to house e-courses taught by Arianna Huffington. A vacation e-mail mobile app that automatically deletes new emails until users are back in the office. Voice-controlled applications for Amazon Alexa to help users “power down” for sleep. Rajiv needed a partner to build the framework that would tie all these services together into a single, cohesive experience. Pulling off a launch of this caliber under a fast-approaching deadline required meticulous planning and an agile methodology. After an exhaustive search for the right partner, Thrive Global chose Very to help design and engineer this digital platform. "We chose Very because their strict adherence to agile methodology," recalls Rajiv Pant, CTO of the Wall Street Journal (former CTO of Thrive Global). "Their processes fit how we wanted our platform to be built and rolled out." The initial feature-set of this platform was big, and the timeline to build was aggressive — even for an agile approach. To mitigate the initial scope, we sat down with Rajiv and Thrive’s Product Owner to devise an initial set of features that we could use to test their market assumptions. “They helped us prioritize and focus our initial scope, which meant they were able to quickly prototype and test our initial assumptions,” says Rajiv. Because we believe in rapid prototyping, it was important to give the Thrive team a working product to test in the first few weeks of the project. We leveraged the Medium API and built out a Rails Admin to allow the Thrive team to test the flow of content between Medium and their custom admin. Early testing gave Thrive time to get used to the new workflow and to identify potential problems well before launch. We evaluated e-commerce vendors and decided to build Thrive’s e-commerce marketplace with Shopify. The finished product coordinates the sale of digital products, third-party products via dropshipping, and partner products from Peleton and Fitbit. We onboarded over 70 different vendors with hundreds of SKUs in time for launch. We leveraged the Medium API and built out a Rails Admin to allow the Thrive team to flow content between Medium and their custom admin. We evaluated e-learning vendors and decided to use Teachable to build Thrive’s e-course, which uses scientifically proven methods to decrease stress and burnout. The six-week course incorporates video content alongside reading assignments and includes tracking tools to help students monitor their progress. We built a reusable framework so the Thrive team can quickly build Alexa skills. We used the framework to build the first Thrive for Alexa skill, which uses voice commands to help users relax before going to sleep — without any screens in the bedroom. Voice commands help users unwind with a http://www.verypossible.com/blog/trial-and-error-an-iterative-approach-to-developing-alexa-skills-2guided meditation from Agapi Stassinopoulos. We handled every aspect of the product engineering: DevOps, prototyping, systems architecture, and front-end and back-end development. 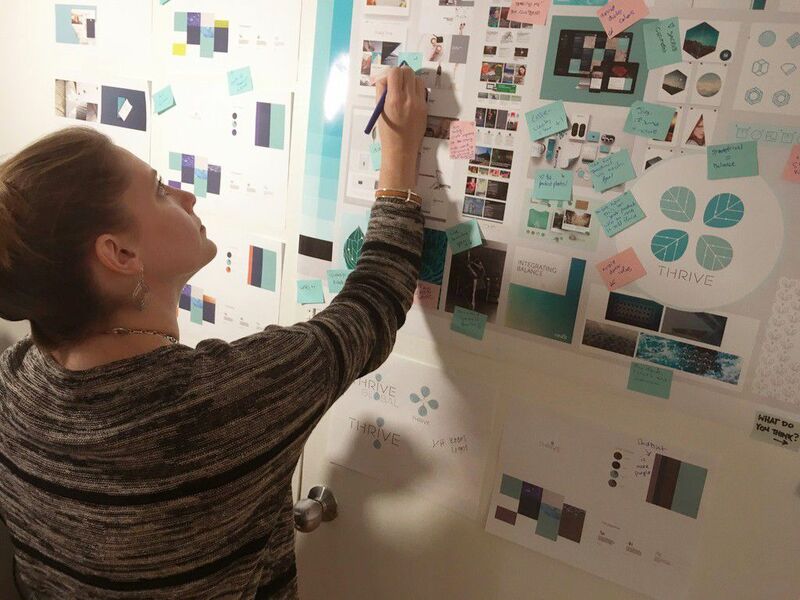 We also guided the strategy for UX, information architecture, and analytics. The result was an incredibly engaging and highly functional platform that positions Thrive to better serve its mission. We launched on time, and Fortune announced the launch just 45 minutes later. 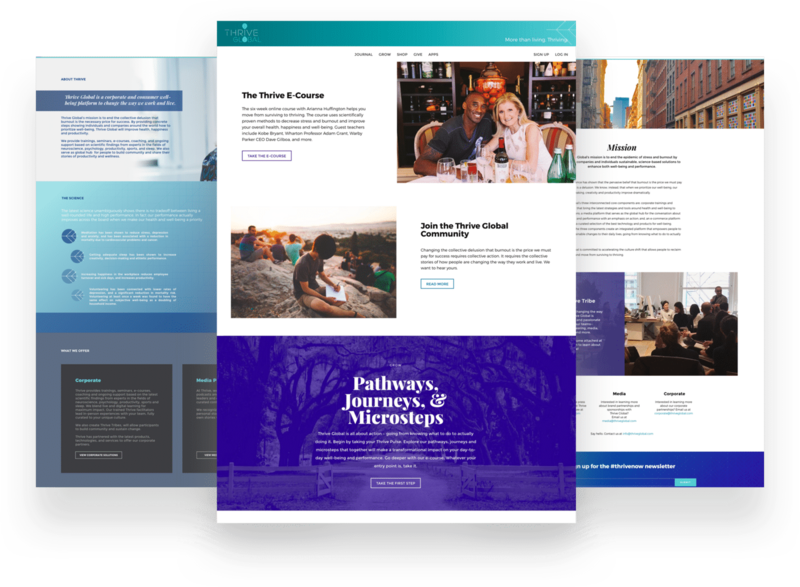 The site was instantly flooded with visitors, and the infrasthttp://fortune.com/arianna-huffington-thrive-global-company/ructure held up to traffic spikes with ease. "With development led by Very, this launch was among the top 10% of platform launches I have ever been a part of," says Rajiv Pant, CTO of Thrive Global. We were impressed with Rajiv's leadership throughout the process. He kept the big picture in mind from every standpoint — architecture, security, DevOps — despite the incredibly tight timeline. His work as a team integrator kept the e-commerce, media, and engineering teams on the same page throughout the project. He even got his hands dirty and wrote some code right before the launch! The Thrive Global homepage also boasts page load times of 1.45 seconds — faster than 82% of tested sites — which is especially impressive considering that it hosts significantly more content than many other sites. After the launch, Rajiv wanted the platform ownership to be transferred to his internal team for upkeep. 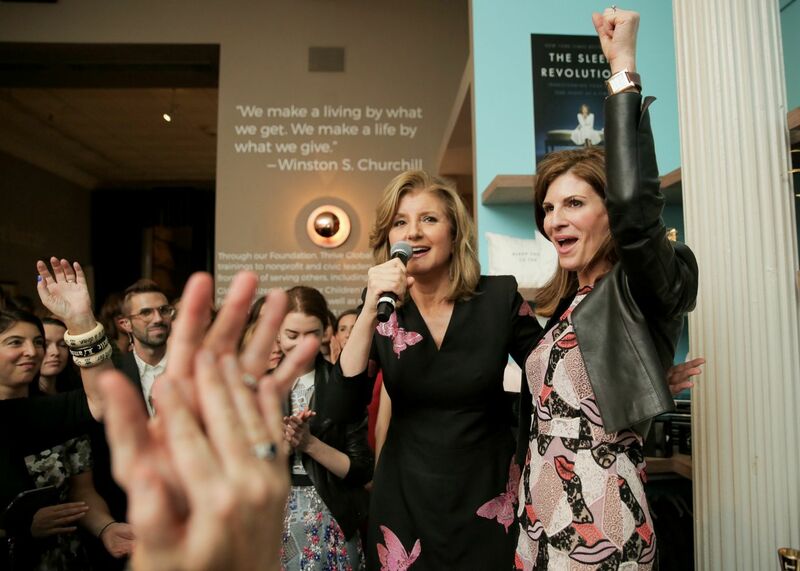 "Very was truly our partner in launching Thrive Global's digital media presence," says Arianna Huffington, founder and CEO of Thrive Global. "In a short time-frame, they designed and problem-solved alongside our team seamlessly. They are flexible, creative, focused on quality and good people all around." We help companies build products that serve the real needs, goals, and passions of real people. At our best, we make people’s lives easier, bringing people together. We are glad we can do this with Rajiv and the talented team at Thrive Global!